This 9-month class is designed around Jacqueline deJonge's "Dream Flight" pattern, which she offers as a Block of the Month. Because so many different fabrics are used each month, you'll need to purchase your pattern plus the Dream Flight kit or your own fabric choices at Sew Many Quilts prior to the start of class. Sew Many Quilts has purchased a substantial amount of Jacqueline's fabrics so we can take care of all your needs for this class. As a result, this is a class only for those who have purchased Dream Flight kits we have cut for you. Also offered is this series of 16 classes to help you learn Jacqueline's paper piecing methods, to work through all the different components of her pattern, and to encourage you to get your quilt finished! We will be meeting on the second Sunday of the month (Noon - 4P) and again on the last Thursday of the month (10AM - 2PM). Some changes for holidays and shop activities have been made. For example, our Sunday class in May has been moved to the first Sunday, May 5, because of Mother's Day the following Sunday. There will be no classes in July, and the holidays at the end of the year will affect our schedule. We'll decide as a class how we want to handle this. Classes are very affordably priced at $3.00 each. You must sign up (either online or in the store) at least 24 hours prior to each class so we can appropriately lay out the classroom space. You are welcome to come to one or both classes each month. The material covered will be the same for both classes during the month. We will be following the Block of the Month guidelines in the Dream Flight pattern, so for the first seven months, we will be making just two circles a month. This is a very doable plan! Want more details on how this works? Click here to learn more about the Dream Flight BOTM from Jacqueline. Come and have fun and perhaps make some new friends as we take this Dream Flight together! 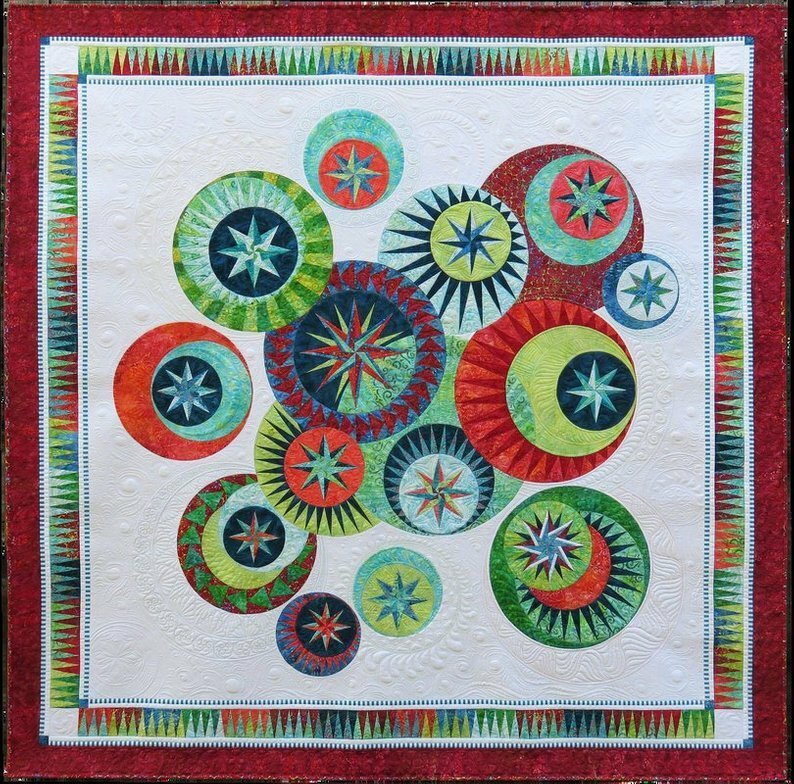 This is a workshop/class for those who have purchased their materials at Sew Many Quilts. Skill Details: Familiarity with basic paper piecing skills is a must. This pattern is a Level 4 (out of 6), but taken step by step, it is not only very doable, but results in a stunning quilt! Materials Included: Please purchase your fabrics and pattern prior to class. Requirements: Fabric, supplies, and tools are all listed on the back of the Dream Flight pattern. Please bring your sewing machine in good working order, along with your Basic Sewing Supplies (BSS - see Class Supply Lists).